Most dog owners love to give their pets an occasional treat. However, it's important to remember that some human foods should not be eaten by dogs. While cashew shells can be very toxic, you can offer small amounts of these (shelled) nuts to most dogs. Most dogs can eat cashews as an occasional snack. However, they are high in fat, so keep this in mind when handing them out as a treat. An average 10-pound dog requires about 220 calories a day, so one ounce of cashews will account for almost three-quarters of that pet's needs for the day. Pet obesity is a huge problem and can put your pet at risk of serious medical problems. As a result, consuming too many cashews can be bad for dogs. There are no known health benefits to feeding your dog cashews. However, if your pet likes them and does not have any medical concerns, they can be used as a treat. While a few cashews are fine for a treat, it's a good idea to be aware of some potential issues with feeding cashews to your dog. Dogs that have had pancreatitis should not eat food items that are high in fat and should avoid cashews. 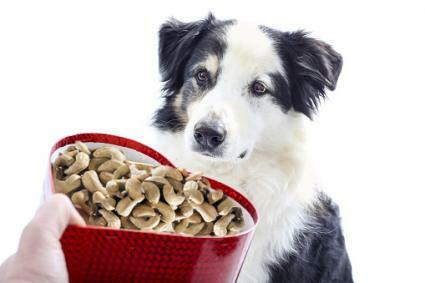 If your pet is on a prescription diet for other medical problems (diabetes, bladder stones, kidney disease, etc) you should ask your veterinarian before feeding your dog cashews. Some cashews are salted, so you should avoid these in pets with heart disease. If your dog eats too many cashews (or other human foods) at once, she could get very sick. Too many cashews may lead to vomiting and diarrhea in a lot of dogs, so make sure any tasty treats are out of reach when you can't supervise your pet. A large fatty meal can also trigger pancreatitis in some dogs. Make sure that you avoid feeding your dog any cashews that are unshelled. The toxin in the shells is called anacardic acid and can cause severe gastroenteritis. The shells can also be irritating to the skin. Also, inspect nuts for mold before feeding them to your dog. Some types of mold can contain aflatoxin, a very dangerous toxin that can cause liver failure in dogs, livestock, wildlife, and people. While nut allergies can be very dangerous in people, these specific sensitivities have not been reported in dogs. Dogs can develop food allergies, but these generally involve substances like beef, dairy, chicken, or egg. If you suspect that your pet is having an allergic reaction, contact your veterinarian and avoid the suspected food item. In humans, phytosterols can help to lower your cholesterol. However, dogs do not get the same type of cardiovascular disease that is seen in people, so this is not likely to be a relevant benefit in dogs. While it is generally okay for most dogs to eat cashews in limited quantities, don't assume this is true for all nuts. Several kinds of nuts are bad for dogs. Dogster.com cautions that macadamia nuts "are highly toxic to dogs, even in limited quantities." Other kinds of nuts that are not good for dogs include walnuts, hickory nuts (also known as black walnuts), pecans, pistachios, almonds and some others. PetMD cautions against feeding dogs any kind of chocolate-covered nuts (because dogs can die from eating chocolate) and any nut products sweetened with xylitol, as xylitol is poisonous to dogs. You should also avoid giving your dog any kind of unshelled nuts, as the shells can be dangerous for dogs. If you decide to feed your dog cashews, start with just a few pieces. As long as your canine friend likes them, and you offer them sparingly, you can use them as a convenient treat anytime.